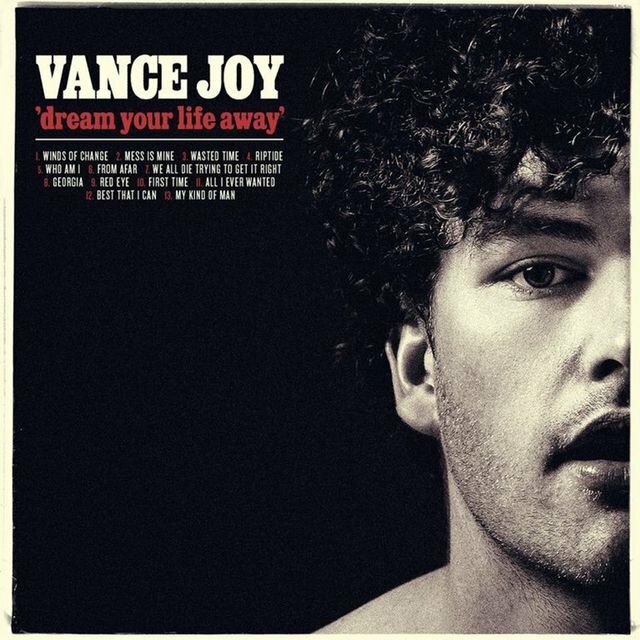 Vance Joy has been riding one heck of wave. Under his birth name, James Keogh, the honey-voiced Australian started out playing out in Melbourne open-mics while studying law at university. His stage moniker is taken from a minor character in a Peter Carey novel. Before even getting the change to release a proper album, the charming and humble singer-songwriter was swept up in a mighty hysteria behind his endlessly catchy single, “Riptide.” That song alone carried its affable creator around the globe several times over. It was only this fall that Vance was able to put out his debut. Dream Your Life Away was recorded outside of Seattle with producer Ryan Hadlock (The Lumineers, Gossip, Johnny Flynn). A handful of songs (“Mess is Mine,” “Winds of Change” and “Georgia”) were finished in a tree house on the studio grounds. While it would be unrealistic to expect another hit as viral as “Riptide,” Dream Your Life Away stands on its own two feet as a truly great album all the way though. 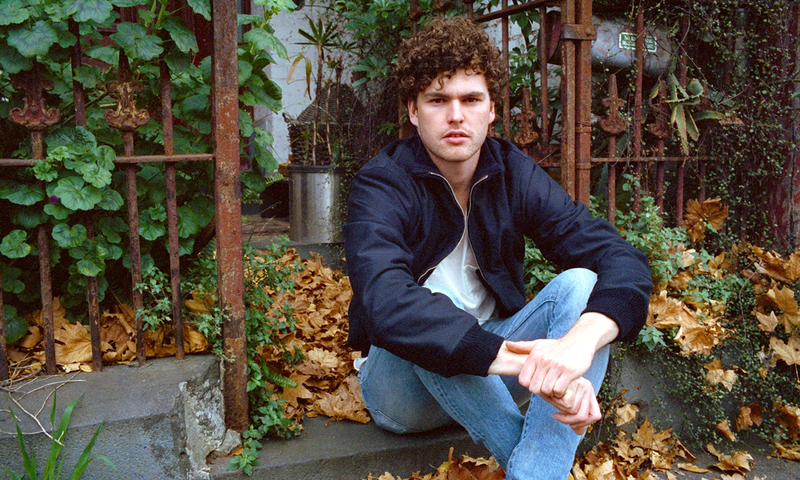 We talked to Vance Joy as he was preparing to play to his biggest audiences yet on a massive tour with Taylor Swift. While the pairing may be somewhat unexpected given his indie-folk roots, Swift allegedly handpicked Vance as her supporting act due to her love for the album. It’s been a crazy ride for you. Well before even beginning your first album, “Riptide” had become a massive hit. A year and a half later, what has that ride been like? I’ve definitely had to adapt to a new pace of life. It all started with this little 5-song EP that took a week to make. I’ve been touring ever since, and the touring has gotten busier and busier. I guess the more exposure you get the more opportunities you have, and more doors open until you always have somewhere to be. I’m more well-adapted to it now, but it was late last year when I thought I’d hit a breaking point. I lost my voice for a couple months, my body was just unused to the rigors of touring. I think I have a bit more perspective on it now, but it’s still just go, go, go. The big news is of course that you’ll be accompanying Taylor Swift on her upcoming tour. Are you prepared for that? I don’t know if i’m prepared. It’s definitely going to be the biggest audiences I’ve ever played to – and maybe ever will play to. You can never be totally ready for those kinds of challenges; at some point you just have to take a leap of faith and go for it. We’re going to do all we can to prepare, but I think it’s going to be something of a baptism of fire. Despite Taylor Swift and the popular success of “Riptide,” you would generally be considered something of an “alternative” artist. Do you have trouble identifying as a pop artist? Not really. I think my taste is generally of an alternative-indie mind, but ultimately I appreciate good, well-written songs. That goes for every genre and doesn’t rule out music just because it’s popular. A lot of the popular songs out there are so liked because they are really, really well-written. In terms of how I identify myself, I don’t think I’ve lost a sense of who I was when this all started. If you take an artist I’ve idolized for a long time, like Ryan Adams, and put me in the same room with him, I’m still gonna be that geeky fanboy. Songwriting is still a challenge and I’m still unsure of the songs I write. You just keep trying and hopefully make it to that next breakthrough. What do you think it is in your songwriting that resonates with people so much? I think it has something to do with the way I sing, I have unique sounding voice. And I’d like to think the lyrics I put together are unique – at least they are to me. If could project what I hope resonates with people, it’s that my voice and lyrics are something unique, and that my music comes from the heart. Can you talk about that process of making a full album, as opposed to a single or an EP? The biggest difference was how long we had in the studio – two months. It’s the difference between giving yourself 15 minutes to do something and giving yourself two hours – either way you fill out that time. With more time we just kept going back over the songs, thinking about the fine details and honing in every last one of them. We used every bit of time we were given up in Seattle with Ryan Hadlock at his Bear Creek Studios. It can be daunting handing your songs over to a producer and allowing them to make suggestions and make additions. At least at the start you don’t know what you’re getting yourself into. But by the end it’s funny how it all comes together and you realize how much you like all those parts you were worried about. It’s funny, but since recording I haven’t really gone back and listened to the album itself. You have such a close relationship with the material while you’re recording it, and then it stops. Was it a mental obstacle to follow up a runaway hit like “Riptide”? Yeah, it was. My mentality was to keep chipping away, to keep songwriting. My objective was to build a collection of songs around that tune that would hopefully last. That’s just the predicament I’m in: I’ve had a really big song and some people will only look that far. My hope is that I can harness a few people who will appreciate my other songs as well. That’s a song I wrote on New Year’s Day. It’s probably a song that sticks out on the album because of the fingerpicking and the production. I was playing a version of that guitar pattern way back in 2006 or 2007, and I never had a place for it. Finally I was able to sing some verses over it that worked, and it all flowed out really easily after that. That was a special moment to win over that song. At that point we’d already recorded all the songs for the album so it was very much a last-minute addition. You’ve said you gain a lot of inspiration from books and film. I just like to fill my brain up with books and films – it fills up that well of inspiration for me. I like watching people going about their business, listening to conversations, it gives me a pool of words and images to draw from. Where else do get inspiration? I think traveling, being on the road is really good for that. Well, I’m not sure it is actually… It’s valuable in how it allows to have different experiences, but it’s when you come back from a tour that the actually creativity can happen. You studied law at University. Does that show up in your music anywhere? I think studying law made me aware of what I didn’t want to do, and for that lesson it was a worthwhile experience. Law is not a very nourishing subject for creativity, but being in school did give me a lot of time to play music alone and work on my songwriting. As we discussed this has been a pretty remarkable couple of years for you. Where do you see yourself in another year or two from now? It’s really hard to fathom. We’re going to be touring over the next year, and hopefully I can write and record something new after that. Long-term it seems foolish to speculate anymore; I’ve learned that anything can happen.